When it comes to your crawl space, a lot of homeowners have an “out of sight, out of mind” mentality and forget that crawl spaces must be maintained just like any other part of the house. If a crawl space is left neglected, any issues can become worse and cause bigger, more expensive problems in the long run. At Total Foundation Solutions, we offer a variety of customized crawl space repair solutions for our customers. Repairing your crawl space will leave you with little to no maintenance and give you peace of mind without having to worry about the health of your crawl space. Crawl spaces are prone to issues based on the way they are designed. They usually lack proper ventilation or air flow and are typically dark, damp places that most homeowners forget about. Water damage is typically the main culprit for crawl space issues. Given their damp, low-air circulation environments, any water that enters the crawl space is bound to do some serious damage if it’s not taken care of. As water sits in your crawl space, it can lead to poor air quality and structural damage over time. Unfortunately, those issues aren’t contained to only your crawl space and can impact the main living areas of your home as well. The stack effect allows any air in your crawl space to seep up through the floor boards and into your main living areas. If the air in your crawl space isn’t healthy, the contaminated air can infiltrate your home and potentially cause health problems for you and your family. Symptoms of crawl space damage can appear in many different forms. As a homeowner, it’s important to regularly check on the health of your crawl space to catch problems early before they become worse. If you notice any of the following symptoms, contact the experts at Total Foundation Solutions for a crawl space repair recommendation. The lack of air circulation combined with water damage creates an environment where mold can easily grow. Mold growth can contaminate the air in your crawl space and create an unhealthy environment. The stack effect can cause these dangerous mold spores and unhealthy air to enter your main living areas and contaminate the air you breathe every day. 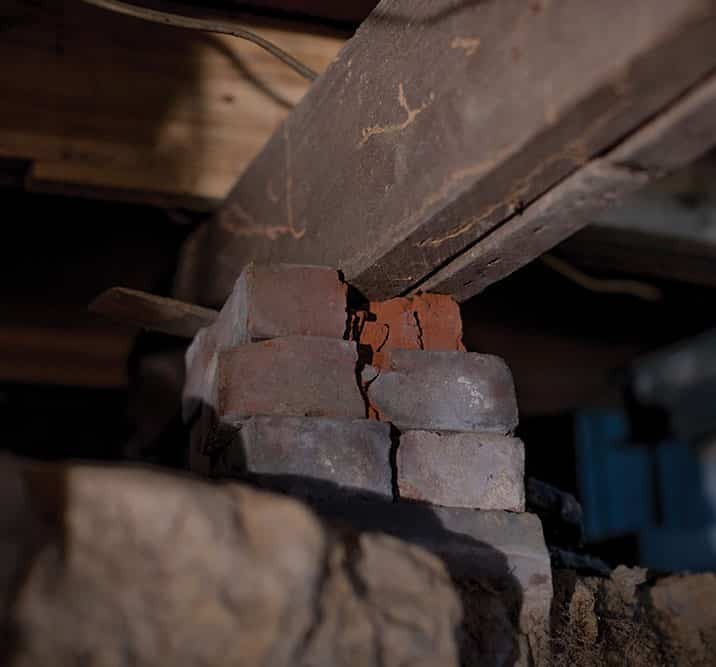 Crawl spaces can develop structural damage that can impact the inside of your home. Water damage in your crawl space can cause the wooden floor joists to become weak and no longer support the weight of the floor above it. Rotted floor joists are often a result of water damage in a crawl space and can cause major structural damage to your home. Given their dark, damp nature, crawl spaces are a perfect environment for unwanted pests. Bugs and pests love to live in these kinds of places, so it’s important to keep your crawl space maintained to keep them out. At Total Foundation Solutions, we offer our customers a number of different solutions for crawl space repair to keep it clean and healthy. Not every crawl space is treated equal, which is why we offer customized solutions. Notice sagging floors in your home? The floor joists in your crawl space could be weak from water damage and cause your internal floors to sag. We can lift them up with our crawl space support posts to keep the floors inside your home level. One of the best ways to keep your crawl space clean and healthy is crawl space encapsulation. Our team installs a thick vapor barrier to give you a clean, mold-free, pest-free environment, and also gives you more storage space. Total Foundation Solutions has served all of Northwestern Pennsylvania and Western New York with foundation, crawl space, and concrete repair for over 30 years. We are proud to be a part of the international Supportworks network to offer our customers the top products in the industry. Contact us today for your free crawl space repair estimate!